ASIS 2014, Atlanta, GA. – September 29, 2014 – DW®, the industry leader in digital recorders, surveillance cameras and related management software, announces the availability of our new DW® Mobile App for iOS. Attendees will be able to experience the new App at the ASIS International Seminars and Exhibits September 29 – October 2, 2014, Booth 3145. 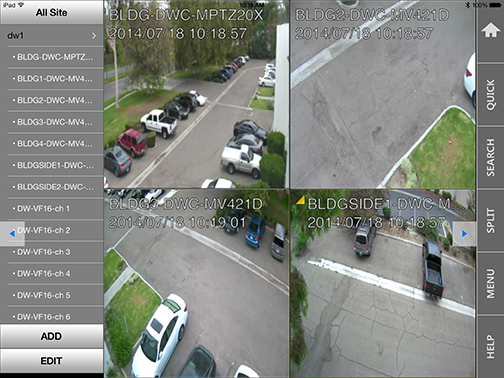 The DW® Mobile App for iOS works seamlessly with DW®’s popular DW Spectrum™ and allows you to monitor, configure and control your entire surveillance system from your smart phone and tablet. The new mobile client will be released in three phases, with iPad support available now. The App will be available in LITE and Pro versions to match any application and need. The LITE version will be available at no charge and support features such as unlimited sites management with single site monitoring in live and playback, PTZ control, image export and two-way audio. The Pro version for large scale applications will support all the LITE App’s features and offer additional functionality such as multi-site monitoring, remote setup, notifications and App password protection. The Digital Watchdog Mobile App will support monitoring for all DW Spectrum™ servers, including the Blackjack™ NVR series. Additional integration with all of DW®’s VMAX™ and VMAX960H™ solutions to come early 2015.